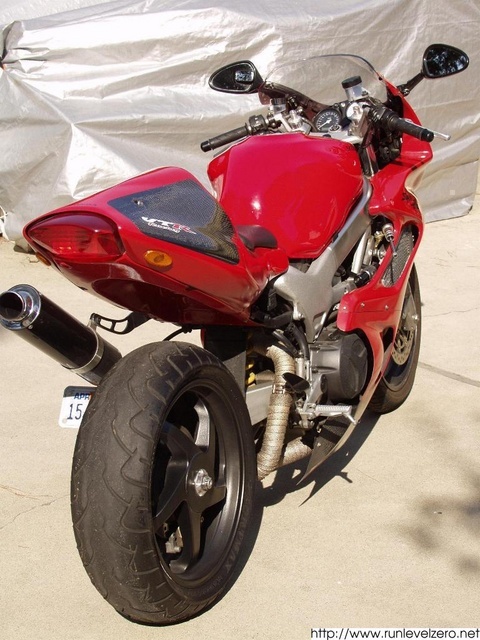 To proceed, you'll need to buy some parts (eBay is a good source, or a local bike wrecker) i.e., a complete 1998 or later VFR800 single-sided swingarm, (the 750 arm will NOT work), arm-axle and nut w/ spacers, drive-hub and cush-drive, sprocket, disc, caliper, wheel, lugs, brake line, and shock linkage plates with bolts. 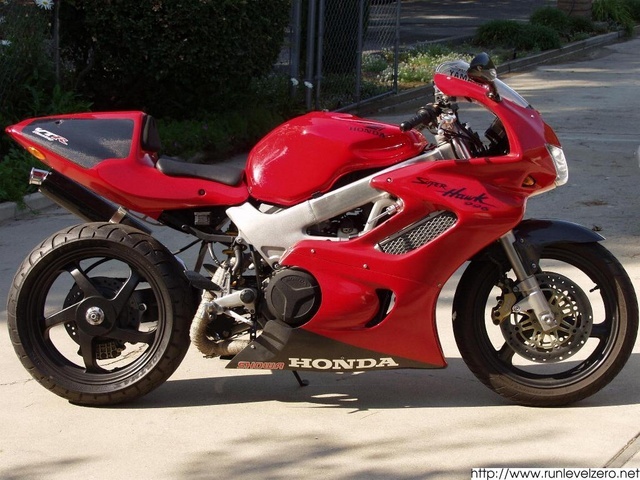 Make SURE the bike was not rear-ended, the rims are true, and the swingarm arm is not cracked or tweaked in any way. That could lead to disaster, so be careful please. If you have to, pay more for a pristine setup...it will save you a lot of pain and suffering further on down the road. The rear wheel I'm using is a stock '98 VFR wheel, but with a "hub cap"
there that are narrower and don't look as good as this one does (heavily-radiused, curved spokes) I also like the 1991-1993 wheel with the 8 spokes. It's all a matter of taste, cost, and availability really. 2) A new 'dogbone' connecting-rod must be fabricated to connect the shock linkage lower mount plates to the engine-mounting. 3) The rear (OEM or aftermarket) shock must be moved 1.75" to the left, putting it (unfortunately) directly in the rear header path. location. New headers need to be built generally. 5) Brake line from the stock VTR master cylinder to the VFR caliper must be routed and secured, and second (linked-brake) connection blocked off. 6) Install a longer chain...the awingarm adds about 1.5" to your wheelbase. 7) Go for a nice long ride and look cool!!!! While the first 3 items were no big deal, the fabrication of a new exhaust system is indeed a LOT of work. I fabricated mine myself, a two into one left-side cannister affair that allowed full, unobstructed view of the rear wheel from the right side. Brake line hookup is relatively easy. Another SSS convert (Daz) ran a braided line through the swingarm. It looks really nice and I may do it myself. I can provide photos of various steps in my conversion if you would like. Keep reminding me, as I may forget to reply if I'm busy, which is most of the time unfortunately. Would you consider putting together a whole kit for me at a cost? could you email me the bracket drawing and pics of install. I would like to do this also. Guys, can we please keep the KB articles on topic. This is not my bike. The owner is Brian Light. His email address is in the post. I noticed from the pics you didn't change the front end much. 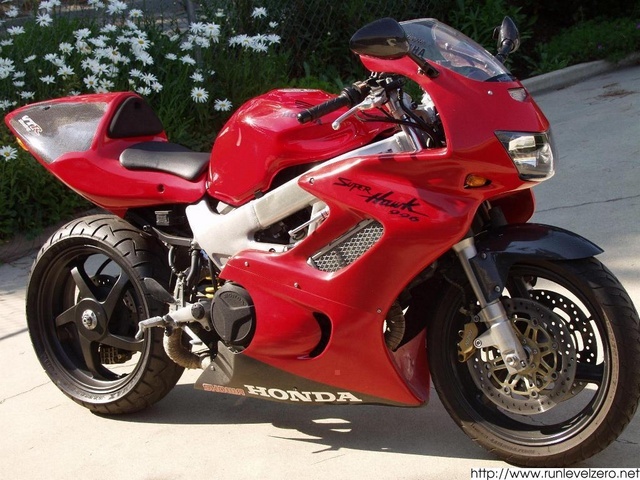 I see the VFR bars (a mod I've made already), and the fender (?). What did you do there specifically, and how does the SSA version handle (comparitively). I have a HawkGT, with similar chassis mods, and I'm concerned about handling changes. I'm accumulating parts for my SSA conversion, and ALL help you can give will be appreciated. Beautifull ! !, where did you get the front blinkers ? I'll try and help if I can!